We are two weeks into the 2017 college football season and the SEC has already had some marquee match-ups. 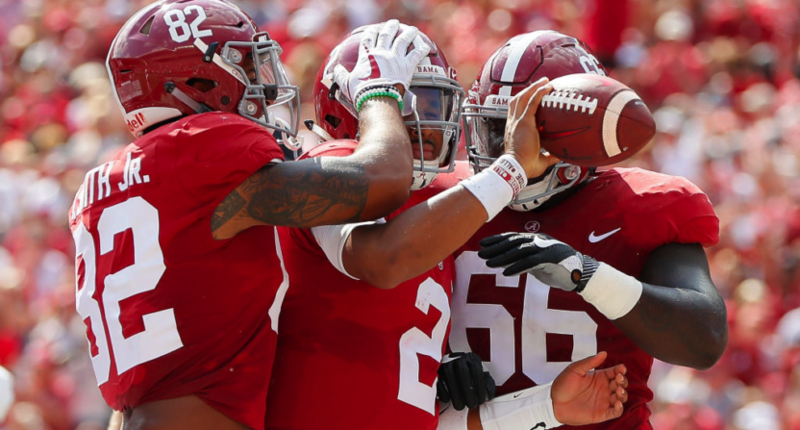 There has been some good news for the conference as Alabama beat Florida State, Georgia outlasted Notre Dame, Tennessee survived Georgia Tech, South Carolina beat NC State and LSU thumped BYU. But there has also been some less than good news for the conference with under-manned Florida losing to Michigan, Texas A&M falling apart against UCLA, Auburn stalling against Clemson and Arkansas getting handled by TCU. Alabama is still the team to beat. We expected this. What we didn’t expect is just how thoroughly they beat Florida State in Week 1. Many, including myself, thought the Seminoles would give the Tide more of a challenge. That never came to fruition and the Tide cruised through their first two games. LSU looks good. But I’m still taking a wait-and-see approach. LSU’s season-opening shutout of BYU didn’t look as impressive after the Cougars also lost to rival Utah. We are only two games into the season, but the Tigers are allowing just five points per game. If the offense (see: passing game) comes around, then LSU could be a legitimate contender for Alabama. Auburn still hasn’t fixed its offense. Jarrett Stidham is on board and Rhett Lashlee was banished to UConn, but the Auburn offense is still lost. Clemson has an excellent defense, but the fact that the Auburn offense totaled only 117 yards is a joke. The good news for Auburn is that they have back-to-back cupcakes (sorry, Missouri) to get their offense right. The mid-tier of the SEC West is in trouble. We will leave Mississippi State and Ole Miss out of this conversation as they have scheduled down the first two weeks (a staple of the Dan Mullen regime at Mississippi State). Texas A&M and Arkansas have both suffered early embarrassing out-of-conference losses. A&M had an epic collapse against UCLA and Arkansas didn’t show up against TCU. Both of these teams have a chance to right the ship, but I wouldn’t count on them being in the hunt this season. Georgia’s defensive front makes them a contender. Georgia didn’t look great against Notre Dame on Saturday, but they went on the road and nabbed a big win on the strength of their defense. If Georgia’s front seven can play like they have in the first two games, then the Bulldogs are the front-runner in the SEC East. South Carolina looks like they are ahead of schedule. The Gamecocks started the season with a tough game against NC State and they prevailed. In Week 2, they handled Missouri. Will Muschamp should get kudos for getting the Gamecocks out of the gate quickly. The Kentucky game next week will really let us know just how far the Gamecocks have come. If they can avenge last years loss to the Wildcats, South Carolina could be in the running for a finish in the upper half of the SEC East. Everything else in the SEC East is a giant question mark, except for Missouri. We know Missouri is horrible, or at least their defense is horrible. Kentucky and Vanderbilt have scheduled down. We know nothing about them. Tennessee’s win over Georgia Tech was a quality win, but it was very reminiscent of 2016 Tennessee. Florida had so many players suspended against Michigan in Week 1 that it’s hard to tell what they will be in 2017. Week 3 will provide more answers in the SEC, headlined by two strong matchups. Tennessee squares off with Florida, LSU travels to Mississippi State, South Carolina seeks revenge on Kentucky at home, Vanderbilt hosts Kansas State and Ole Miss travels to face Cal on the left coast.